The very thing the 16 skiers and snowboarders had sought — fresh, soft snow — instantly became the enemy. Somewhere above, a pristine meadow cracked in the shape of a lightning bolt, slicing a slab nearly 200 feet across and 3 feet deep. Gravity did the rest. Snow shattered and spilled down the slope. Within seconds, the avalanche was the size of more than a thousand cars barreling down the mountain and weighed millions of pounds. Moving about 7o miles per hour, it crashed through the sturdy old-growth trees, snapping their limbs and shredding bark from their trunks. The avalanche, in Washington’s Cascades in February, slid past some trees and rocks, like ocean swells around a ship’s prow. Others it captured and added to its violent load. Somewhere inside, it also carried people. How many, no one knew. The slope of the terrain, shaped like a funnel, squeezed the growing swell of churning snow into a steep, twisting gorge. It moved in surges, like a roller coaster on a series of drops and high-banked turns. It accelerated as the slope steepened and the weight of the slide pushed from behind. It slithered through shallower pitches. The energy raised the temperature of the snow a couple of degrees, and the friction carved striations high in the icy sides of the canyon walls. Elyse Saugstad, a professional skier, wore a backpack equipped with an air bag, a relatively new and expensive part of the arsenal that backcountry users increasingly carry to ease their minds and increase survival odds in case of an avalanche. About to be overtaken, she pulled a cord near her chest. She was knocked down before she knew if the canister of compressed air inflated winged pillows behind her head. She had no control of her body as she tumbled downhill. She did not know up from down. It was not unlike being cartwheeled in a relentlessly crashing wave. But snow does not recede. It swallows its victims. It does not spit them out. Snow filled her mouth. She caromed off things she never saw, tumbling through a cluttered canyon like a steel marble falling through pins in a pachinko machine. At first she thought she would be embarrassed that she had deployed her air bag, that the other expert skiers she was with, more than a dozen of them, would have a good laugh at her panicked overreaction. Seconds later, tumbling uncontrollably inside a ribbon of speeding snow, she was sure this was how she was going to die. Moving, roiling snow turns into something closer to liquid, thick like lava. But when it stops, it instantly freezes solid. The laws of physics and chemistry transform a meadow of fine powder into a wreckage of icy chunks. Saugstad’s pinwheeling body would freeze into whatever position it was in the moment the snow stopped. After about a minute, the creek bed vomited the debris into a gently sloped meadow. Saugstad felt the snow slow and tried to keep her hands in front of her. She knew from avalanche safety courses that outstretched hands might puncture the ice surface and alert rescuers. She knew that if victims ended up buried under the snow, cupped hands in front of the face could provide a small pocket of air for the mouth and nose. Without it, the first breaths could create a suffocating ice mask. The avalanche spread and stopped, locking everything it carried into an icy cocoon. It was now a jagged, virtually impenetrable pile of ice, longer than a football field and nearly as wide. As if newly plowed, it rose in rugged contrast to the surrounding fields of undisturbed snow, 20 feet tall in spots. Saugstad was mummified. She was on her back, her head pointed downhill. Her goggles were off. Her nose ring had been ripped away. She felt the crushing weight of snow on her chest. She could not move her legs. One boot still had a ski attached to it. She could not lift her head because it was locked into the ice. But she could see the sky. Her face was covered only with loose snow. Her hands, too, stuck out of the snow, one still covered by a pink mitten. A narrative of interwoven words and multimedia. Breathe easy, she told herself. Do not panic. Help will come. She stared at the low, gray clouds. She had not noticed the noise as she hurtled down the mountain. Now, she was suddenly struck by the silence. The Cascades are among the craggiest of American mountain ranges, roughly cut, as if carved with a chain saw. In summer, the gray peaks are sprinkled with glaciers. In winter, they are smothered in some of North America’s deepest snowpack. The top of Cowboy Mountain, about 75 miles east of Seattle, rises to 5,853 feet — about half the height of the tallest Cascades, but higher than its nearest neighbors, enough to provide 360-degree views. It feels more like a long fin than a summit, a few feet wide in parts. Locals call it Cowboy Ridge. To one side, down steep chutes, is Stevens Pass ski area, which receives about 400,000 visitors each winter. To the other, outside the ski area’s boundary to what is considered the back of Cowboy Mountain, is an unmonitored play area of reliably deep snow, a “powder stash,” known as Tunnel Creek. It is a term with broad meaning. The name is derived from the Cascade Tunnel, originally a 2.6-mile railroad tube completed in 1900 that connected the east and west sides of the Cascades, a boon for the growth of Seattle and Puget Sound. The mountain pass that it burrowed beneath was named for the project’s engineer, John Frank Stevens, who later helped build the Panama Canal. In late February 1910, ceaseless snowstorms over several days marooned two passenger trains just outside the tunnel’s west portal. Before the tracks could be cleared, the trains were buried by what still stands as the nation’s deadliest avalanche. It killed 96 people. Bodies were extricated and wrapped in blankets from the Great Northern Railway, then hauled away on sleds. Some were not found until the snow melted many months later. To skiers and snowboarders today, Tunnel Creek is a serendipitous junction of place and powder. It features nearly 3,000 vertical feet — a rarely matched descent — of open meadows framed by thick stands of trees. Steep gullies drain each spring’s runoff to the valley floor and into a small, short gorge called Tunnel Creek. The area has all of the alluring qualities of the backcountry — fresh snow, expert terrain and relative solitude — but few of the customary inconveniences. Reaching Tunnel Creek from Stevens Pass ski area requires a ride of just more than five minutes up SkyLine Express, a high-speed four-person chairlift, followed by a shorter ride up Seventh Heaven, a steep two-person lift. Slip through the open boundary gate, with its “continue at your own risk” warning signs, and hike 10 minutes to the top of Cowboy Mountain. When snow conditions are right, the preferred method of descent used by those experienced in Tunnel Creek, based on the shared wisdom passed over generations, is to hopscotch down the mountain through a series of long meadows. Weave down the first meadow, maybe punctuate the run with a jump off a rock outcropping near the bottom, then veer hard left, up and out of the narrowing gully and into the next open glade. Another powder-filled drop ends with another hard left, into another meadow that leads to the valley floor. Tunnel Creek is, in the vernacular of locals, a “hippie pow run” — breezy and unobstructed, the kind that makes skiers giggle in glee as they descend through a billowing cloud of their own soft powder and emerge at the bottom coated in white frosting. Despite trends toward extreme skiing (now called freeskiing), with improbable descents over cliffs and down chutes that test the guile of even the fiercest daredevils, the ageless lure of fresh, smooth powder endures. But powder and people are key ingredients for avalanches. And the worry among avalanche forecasters, snow-science experts and search-and-rescue leaders is that the number of fatalities — roughly 200 around the world each year — will keep rising as the rush to the backcountry continues among skiers, snowboarders, climbers and snowmobilers. The backcountry represents the fastest-growing segment of the ski industry. More than ever, people are looking for fresh descents accessible by helicopters, hiking or even the simple ride up a chairlift. Before 1980, it was unusual to have more than 10 avalanche deaths in the United States each winter. There were 34 last season, including 20 skiers and snowboarders. Eight victims were skiing out of bounds, legally, with a lift ticket. And many of the dead were backcountry experts intimate with the terrain that killed them. No one knows how many avalanches occur. Most naturally triggered slides are never seen. Those set off by humans are rarely reported unless they cause fatalities or property damage. But avalanches occur in Tunnel Creek regularly. Its slopes, mostly from 40 to 45 degrees, are optimal for avalanches — flat enough to hold deep reservoirs of snow, yet steep enough for the snow to slide long distances when prompted. The long elevation drop means snow can be fluffy at the top and slushy at the bottom. Temperatures, wind and precipitation change quickly, and something as welcome as a burst of sunshine can alter the crystallized bonds deep inside the snow. And because Tunnel Creek is outside the ski area, it is not patrolled or specifically assessed for danger. In March 2011, a University of Washington student was caught in an avalanche in Tunnel Creek. Having been carried into a stand of trees, he was unburied by friends within minutes and found dead. Three others were partially buried about an hour later when the ski patrol’s arrival set off a second avalanche. Many of the most experienced locals view Tunnel Creek with a mix of awe and fear. Even those who are not leery of Tunnel Creek on the best days heed the pass-it-on warning of the experienced: stay left. To head straight down to the bottom is to enter what experts call a terrain trap: a funnel of trouble and clumsy skiing, clogged with trees and rocks and confined by high walls. Few go that way intentionally. Chris Rudolph, the effervescent 30-year-old marketing manager for Stevens Pass, knew the preferred route down. Tunnel Creek was his favorite at-work diversion. Earlier that weekend, he mentioned plans for a field trip to Tunnel Creek to a select group of high-powered guests and close friends. The operations manager for Stevens Pass agreed to pick up the group in one of the ski area’s trucks at the end of its descent. From the bottom of Tunnel Creek, it is about a half-mile trek through deep snow to U.S. 2, then a four-mile ride back to Stevens Pass. At 11:32 a.m. on Sunday, Feb. 19, heading up the mountain, Rudolph sent a text message to the operations manager. “A big posse,” Rudolph wrote. Like many ideas that sound good at the time, skiing Tunnel Creek was an idea hatched in a bar. It was Saturday, Feb. 18, the afternoon light fading to dusk. Outside the Foggy Goggle, a bar at the base of the ski area, the snow continued to fall, roughly an inch an hour. By morning, there would be 32 inches of fresh snow at Stevens Pass, 21 of them in a 24-hour period of Saturday and Saturday night. That was cause for celebration. It had been more than two weeks since the last decent snowfall. Finally, the tired layer of hard, crusty snow was gone, buried deep under powder. Rudolph promoted Stevens Pass with restless zeal. In seven years there, he helped turn a relatively small, roadside ski area into a hip destination. He unabashedly courted ski journalists and filmmakers to take a look. They, in turn, gave Stevens Pass star turns in magazines and popular ski movies, raising the area’s cool quotient. Rudolph was the oldest of three children raised in California’s Bay Area by outdoors-minded parents. The young family pulled a pop-up Coleman camper around the West and skied at the areas around Lake Tahoe. The grown siblings continued to vacation with their parents, climbing peaks like Mount Whitney in California and Mount Rainier in Washington. Rudolph peppered his language with words like “rad” and “stoked.” But he was no simple-minded ski bum. He was an Eagle Scout with a marketing degree. When he applied at Stevens Pass years earlier, he sent a video of himself speaking, skiing and mountain biking. He included a bag of popcorn for the viewer. He got the job. Children knew Rudolph because he kept his pockets full of Stevens Pass stickers. He starred in self-deprecating Webcasts promoting Stevens Pass. He wrote poetry on his blog and strummed a guitar. He drank Pabst Blue Ribbon, the unofficial beer of irony and the hipster generation. Tunnel Creek was where he took special guests. And it is where he wanted to take the tangled assortment of high-caliber skiers and industry insiders who, as if carried by the latest storm, had blown into Stevens Pass that weekend. Many of them happened into the Foggy Goggle on Saturday night. Among them were professional skiers like Saugstad, 33, a former champion of the Freeride World Tour. There were reporters and editors from Powder magazine and ESPN. There were executives from ski equipment and apparel companies. There were Stevens Pass regulars, some with broad reputations in the niche world of skiing, glad to spend time with the assortment of guests. “It was a very, very deep, heavy, powerful, strong group of pro skiers and ski industry people,” said Keith Carlsen, a photographer and former editor of Powder. Rudolph was the connecting thread. Some visitors, like Saugstad, were at Stevens Pass for a promotional event aimed at expert female skiers, sponsored by Salomon, the ski equipment maker. Rudolph skied with the group all day Saturday. He organized and hosted a catered dinner for the women later that night in Leavenworth, a serious outdoors town dressed as a Bavarian village, 35 miles downhill to the east. Powder had come to spotlight Stevens Pass for a feature article on night skiing. When the magazine’s editor, John Stifter, arrived by train to Leavenworth two days earlier, he found Rudolph’s car waiting for him. Inside were keys to the car, keys to a slope-side cabin and two Pabst Blue Ribbons in the cup holders. At the bar, Rudolph mentioned an idea to a few people: Tunnel Creek on Sunday. Invitations traveled in whispers and text messages, through a knot of friendships and slight acquaintances. Meet at the fire pit, on the stone deck at Granite Peaks Lodge, at 11. Rudolph thought his Sunday morning staff meeting would end by then. As darkness enveloped Stevens Pass on Saturday night, stadium-style lights flooded the slopes in white light, and snowflakes fell in cotton-ball clumps. Rudolph and those with the Salomon event left for dinner in Leavenworth. Stifter, 29, and Carlsen, 38, headed outside to work on their article for Powder. With the daytime crowds gone, the nighttime atmosphere was festive and the faces were familiar. Families played in the deepening snow. More serious skiers and snowboarders sought the freshest powder. There are no public accommodations at Stevens Pass, only a parking lot available to a few dozen campers and recreational vehicles. As the evening wound down, several of those with loose plans to ski Tunnel Creek the next morning huddled in the R.V. lot around a fire. Carlsen continued taking photographs. Stifter and others ducked inside one camper to watch homemade videos of others skiing Tunnel Creek over the past couple of decades. The flames in the fire died to orange embers. The last beers were sipped empty, and people slipped into the night. The campers were blanketed with snow. Beyond the lights glowing from the ski area, snow still fell over the ridge, too, in the vast darkness of steep meadows and narrow gullies just past the western edge of Stevens Pass. Each snowflake added to the depth, and each snowflake added to the weight. It might take a million snowflakes for a skier to notice the difference. It might take just one for a mountain to move. A large storm produced 32 inches of snow at Stevens Pass in the three days before the avalanche. The new snow put an increasing load on a fragile crust. Dawn cracked with the intermittent sound of explosives near the top of Cowboy Mountain. Stevens Pass ski patrollers, called to duty whenever more than a few inches of snow fell, had arrived to check and control the ski area’s 200 inbounds avalanche zones. After getting the latest assessment from the area’s full-time avalanche forecaster, more than a dozen patrollers filled their backpacks with 2.2-pound emulsion charges, shaped like cartoon dynamite. Chairlifts rumbled to life, ferrying the crews up the dark mountain. Three two-person teams assigned to Cowboy Ridge removed their skis and filed through the boundary gate. They took turns plowing a path through the fresh snow with their bodies. Their boots forged an icy stairway to the top of the skinny ridge. Back on their skis, facing down into the ski area and with their backs to Tunnel Creek, they spread across the ridge to stamp and destroy wind-swept cornices, small balconies of crusty snow. They removed the charges from their packs. Like party poppers that spew confetti, charges have a pull-wire, an ignition that lights a 90-second fuse. The patrollers lobbed the lighted charges into the many steep chutes below them. With muffled booms, heavy waves of snow tumbled harmlessly into the recesses of the empty slopes below, clearing danger for the day’s thousands of inbounds customers. The lines for the ski lifts began forming about 7, two hours before they were to open. When the gathering skiers and snowboarders heard the explosions echo down the mountain, they cheered. It signaled a powder day. In Leavenworth, Chris Rudolph awoke in his two-bedroom house on Ash Street, the one that he and his girlfriend, Anne Hessburg, painted a rich blue and accented with a garden out front. But he thought the meeting would end by 11. Among those who joined the 45-minute parade from Leavenworth, through tight Tumwater Canyon, past the Lake Wenatchee turnoff and up to Stevens Pass, were Dan Abrams and Megan Michelson. They planned to marry in March. Michelson, 30, was the freeskiing editor for ESPN.com. Abrams, 34, was a founder and the president of Flylow, maker of apparel marketed to backcountry users. The couple lived in Seattle, but had come to Stevens Pass on Saturday for the Salomon promotional event. Michelson and the other women stayed at a Leavenworth hotel. Abrams slept in a spare bedroom at Rudolph’s house. He and Michelson drove to Stevens Pass together. There were similar conversations elsewhere. In the slope-side cabin at Stevens Pass that Rudolph arranged — he cleaned it on Friday as he spoke to his mother on the phone — the journalists from Powder magazine, Stifter and Carlsen, contemplated the day’s plans. Mark Moore, director and lead meteorologist of the Northwest Weather and Avalanche Center, had set that day’s forecast on Saturday afternoon. A 64-year-old with graying hair pulled into a short ponytail, Moore had a feeling it could be a busy weekend. The avalanche center, based in Seattle, is one of about 20 regional avalanche forecasting centers in the United States, most run by the Forest Service. During the winter, one of its three employees arrives in the middle of the night, analyzes weather maps and computer models, and examines data — snowfall, temperatures, wind, humidity and so on — from 47 remote weather stations scattered across the mountains, including five in the vicinity of Stevens Pass. They take calls from ski patrollers and highway crews. The biggest storm of the season increased avalanche concerns. But it was not just the new snow that concerned Moore. It was what lay nearly three feet beneath — a thin layer of perfectly preserved frost called surface hoar. The frozen equivalent of dew, created on crisp, clear nights, it features fragile, featherlike crystals that grow skyward. On the surface, they glimmer like a million tiny diamonds. When frosted and protected by soft blankets of fluffy snow, they are weak stilts supporting all that falls on top. When they finally give way, falling like microscopic dominoes on a steep slope, they provide an icy flume for the snow above. A shot of rain or above-freezing temperatures, both common in Cascade winters, usually destroy the fragile crystals, melding them into the snowpack. But five days of dry, cold weather, from Feb. 3 to 7, created a perfect, sparkly layer of surface hoar. Sporadic light snow, never more than an inch or two a day, delicately shrouded it over the next 10 days. By the weekend, as snow fell heavily over the Cascades and powder-hungry hordes took to the slopes, the old layer was long out of sight, and mostly out of mind. Changes in temperatures, precipitation, humidity and wind can turn a benign snowpack into a deadly one, and vice versa. Sometimes weather is enough to start an avalanche. But “natural” avalanches rarely kill. The majority of avalanche fatalities are in human-triggered slides — usually of the victims’ own making. In the rugged area of the Cascades that includes Stevens Pass, Moore deemed the avalanche danger “high” — the fourth degree out of five — for slopes above 5,000 feet in elevation, facing north to southeast. Moore’s forecast offered more specifics. “Although decreasing light showers and decreasing winds are expected Sunday, cold temperatures should slow stabilization of existing wind slabs and help maintain the threat of further human-triggered avalanche activity, especially on previously wind-loaded terrain showing no evidence of recent avalanche activity,” Moore wrote. Spotty afternoon sunshine, he added, could raise the danger, especially on south-facing slopes. The snow had stopped at Stevens Pass by the time the lifts opened Sunday morning. The runs were quickly doodled with curvy lines. Stifter sat in the cabin and examined the forecast on his laptop. Stifter left Carlsen behind and headed to the lifts. He found Jim Jack. 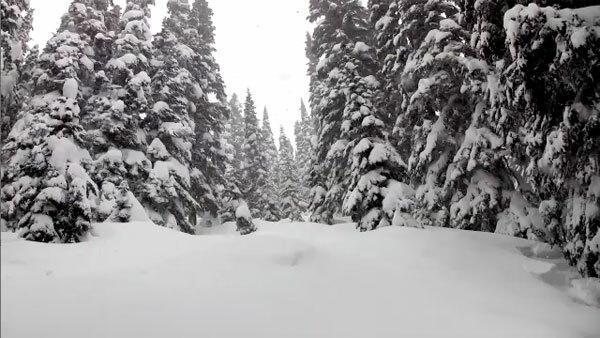 If anyone could judge terrain and snow in the backcountry, it was Jim Jack. The license plate on Jack’s Subaru Brat as a teenager read “IM JIM.” To family and his closest friends, he was Jimmy, sometimes J.J. To most everyone else, he was Jim Jack, blended into one name, accent on the first syllable: JIM-jack. Jack was the head judge and former president of the International Freeskiers Association, which oversaw a world tour of competitions. At 46, he was a sort of Peter Pan of the ski world, a charismatic, carefree boy who never grew up, beloved by like-minded skiers and snowboarders half his age. He spent winters traveling the world, spreading the gospel of freeskiing, professing the beauty of finding improbable ways down precarious slopes with grace, nerve and flair. He had been a competitor on the tour, distinguishable from great distances by the silkiness of his loose form, until he landed hard and took his own knee to his face, shattering the bones around his right eye. You could feel the screws when you touched his face. He was a party accelerator with a penchant for streaking. He did drama in high school and never declined the stage as an adult. On Halloween, his costumes played off his name: Jack on the Rocks, Jim Jack in the Box, Cracker Jack, Jack Frost. Wearing lederhosen, Jack starred in a cheeky promotional video for Leavenworth. He was a sure-handed shortstop for the team from Uncle Uli’s, a bar and restaurant in the heart of town. A grilled chicken sandwich on the menu, smothered in spicy sauce, is named the Napkin’ Slappin’ Jim Jack. Jack shared a bungalow off the highway, near the Howard Johnson, with his longtime girlfriend, Tiffany Abraham. They danced late at night in the kitchen and built bonfires in the backyard. The covered front porch held a pile of ski gear and a futon couch, perfect for watching the world go by, beer in hand. Jack drove a 1994 Chevy pickup with 216,000 miles on it, topped by a Wilderness camper that he added for $350. Widely recognized on the highways and in ski area parking lots around the West, it was held together largely by duct tape and bungee cords. The radio’s volume was stuck on high. If it is too loud, Jack told passengers, just roll down the window. Jack and his camper rolled into the R.V. parking lot at Stevens Pass on Friday night. On weekends, when the snow was good, the lot filled with dozens of pickup campers and motor homes. Jack and Wangen had skied a couple of runs Sunday morning by the time Stifter caught up to them. Wangen knew Tunnel Creek as well as anyone, having skied it since he was a boy. Jack traveled the world, scouting courses for extreme skiing. He knew how to avoid danger. Stifter asked Jack about the avalanche report. The fire pit sits at the center of the bustle on busy days. At the corner of the patio, in front of the lodge, it is a crossroads for people coming and going. Some pull up chairs and relax, facing the bowl of ski runs strung before them. When the clouds lift, Cowboy Mountain dominates the view high to the right. It can feel close enough to reach and touch. By midmorning, the fire pit began attracting a growing but confused band of expert skiers. Some were local, some were visitors. Some knew others, some did not, but most knew either Chris Rudolph or Jim Jack. They traded nods and handshakes, unsure if others were headed to Tunnel Creek, too. Joel Hammond, the 37-year-old regional sales representative for Salomon, had teamed with Rudolph to organize the previous day’s women’s event. He did not intend to ski Sunday until he awoke in Leavenworth and could not resist the lure of the fresh snow. He drove to Stevens Pass and sent a text message to Rudolph, still in a staff meeting. “Chris was like: ‘Meet at the fire pit, where everybody meets. Then we’re going to rally up,’” Hammond said. Hammond told Jack that he had the latest model of skis in his truck, then left to retrieve a pair for him to try. Stifter bought coffee, a couple of Americanos, from the stand for himself and Jack. Tim Carlson and Ron Pankey, both 37 and childhood friends from Vermont, had spent the morning on the inbounds side of Cowboy Mountain, navigating near-vertical chutes and rock outcroppings. During a break, they spotted familiar faces near the fire pit. Pankey was a former competitor on the Freeskiing World Tour, so he had known Jack since the mid-1990s. Like Jack, he eventually worked competitions around the world, including the X Games. Carlson was a snowboarder, not a skier, and a regular at Stevens Pass. Earlier that week, he competed at Washington’s Crystal Mountain. Jack worked the event, and Carlson slept several nights in Jack’s camper. When Carlson and Pankey arrived at Stevens Pass that Sunday, they joined Tim Wesley, known to most as Tall Tim — a lanky 39-year-old snowboarder from Leavenworth. The three merged with those waiting for Rudolph. Another arrival was Wenzel Peikert, 29, an off-duty Stevens Pass ski instructor from Seattle. Skiing over the weekend without his wife and infant daughter, he hung around the Foggy Goggle and the R.V. lot on Saturday night. He, too, sent a message to Rudolph on Sunday, confirming the plan. Among the strangers he saw was Rob Castillo, a 40-year-old father of two and former competitive skier. He had exchanged text messages with Jack. Castillo and Jack lived together in Alta, Utah, for several years in the 1990s. They went helicopter skiing in Alaska and skied down mountains they had climbed in Washington. “Tunnel Creek at 11,” Jack wrote. At the fire pit, Castillo considered the others. More than anything, Castillo wanted to ski for the first time all season with his two best friends at Stevens Pass – Jack and Johnny Brenan. In the R.V. parking lot, a few hundred yards away, Johnny and Laurie Brenan convened in their motor home for an early lunch with their daughters, Josie, 10, and Nina, 7, part of the Stevens Pass ski teams. Brenan, 41, grew up comfortably in the Seattle suburbs, not far from Jack. He followed his passion for skiing to Breckenridge, Colo., working as a ski patroller in the winter and a carpenter in the summer. A burly man whose five o’clock shadow arrived by noon each day, he eventually opened a business that he named for home: Cascade Contracting. They married in 1997 and moved to Leavenworth. Brenan worked as a cabinetmaker, then resurrected Cascade Contracting. On the strength of Brenan’s amicable personality and no-fear creativity, it blossomed with custom homes and expansive remodels. The Brenans bought a deteriorated 100-year-old farmhouse on a hill in an apple orchard. Johnny Brenan lifted the structure on jacks, rebuilt the foundation and gutted the inside, intending to resell it as a bed-and-breakfast. The Brenans kept it for themselves to raise their family. Brenan zipped from one construction site to another in his truck. He coached soccer teams. He held Monday night poker games in the garage, which Nina always helped prepare. He built a chicken coop in the yard. Sunday began perfectly for Brenan. The family R.V. was parked in space No. 3, where the satellite dish picked up the best television reception. Brenan was at the front of the lift line at dawn. He offered to fetch coffee for those behind him, a trick he used to keep his place while he helped Laurie get their daughters fed and dressed. He returned to the line, excited for an increasingly rare chance to ski with old friends like Jack. Back with his family for lunch, Brenan ate an egg sandwich and discussed a business deal on the phone. It was after 11, and he was afraid he would miss the Tunnel Creek run. But Rudolph sent a couple of people text messages at about 11:15. He apologized for running late, and said he would be out in about 10 minutes. Brenan had time. He made a pact with Josie. Brenan strapped on his avalanche beacon, also called a transceiver, a device that emits a silent signal for others to detect your location in case of burial. A friend in the R.V. noted that its batteries were dead. Brenan replaced them with fresh ones. “What’s that, Papa?” Nina asked her father. Brenan paused to show her how it worked. Brenan gathered his things and headed toward the fire pit to join his friends. At about 11:30, Rudolph burst through the doors of the lodge at Stevens Pass. He was surprised by the size of the group waiting for him, but he barely broke stride. “Get me out of here before another spreadsheet finds me,” he said. The group, jolted into action, scattered to gather gear. Stevens Pass opened in the winter of 1937-38 with a rope tow on Big Chief Mountain. A lodge and five new tows were added in the 1940s, including a mile-long T-bar that pulled people up the side of Cowboy Mountain. The ski area took shape in the bowl below the crescent-shape ridge that connects the two mountains. Seventh Heaven, a two-person lift up a steep wall of Cowboy Mountain, changed the complexion of Stevens Pass when it was built in 1960. It opened a high swath of expert terrain, now marked as double diamond — experts only — on posted signs and the ski map. Now there is a steady procession of expert skiers and snowboarders through the boundary gate next to the top of the lift. Most drop off the left side of the ridge, back into the resort, through the rocky and narrow chutes. Those who drop away from the ski area, toward Tunnel Creek, are simply following a much wider trend into “sidecountry” — backcountry slopes easily entered by lifts and, sometimes, a short hike. The rise of backcountry skiing can be credited to a collision of factors. Ski areas that once vigilantly policed their boundaries, from Jackson Hole, Wyo., to Squaw Valley, Calif., have gradually opened their gates to the territory surrounding them. While that has led to wrangling over liability issues and raised debate over search-and-rescue responsibilities, most areas note that they are carved out of public land. They really cannot keep people from going there. But ski areas also see the potential to attract more ticket-buying customers, and more influential ones, by blurring the boundary lines. Many areas slyly promote not just the terrain inside their borders, but the wilder topography beyond, using the power of media and word of mouth — as Rudolph did for Stevens Pass. Skiing adjacent to ski areas, however, can numb people to risk. Easy access, familiar terrain and a belief that help is just a short distance away may lead people to descend slopes they might avoid in deeper wilderness. While most backcountry users would not consider entering known avalanche territory without a beacon, one study last winter at Loveland Ski Area in Colorado found that fewer than 40 percent of people who passed through a boundary gate wore one. Equipment advances have emboldened people. Intermediate powder skiers have been turned into expert ones thanks to fatter skis and the “rocker” shape of their tips — design advances borrowed from snowboarding. Popular ski bindings now temporarily detach at the heel, allowing skiers to glide up rises like a cross-country skier, then reconnect so they can descend like a professional downhiller. Snowboards have borrowed from skis, too. Some models can be quickly split into two pieces, allowing users to stride up short hills in pursuit of bigger descents. Similar advances in safety gear, such as easy-to-use digital beacons and air bags, have helped make the backcountry feel less dangerous. Beacons help rescuers find people buried under the snow, while air bags deploy a large balloon meant to help keep the skier closer to the surface of an avalanche. A leading American manufacturer of safety gear is named, appropriately, Backcountry Access. Companies, including Salomon and Flylow, have marketed heavily to ride the backcountry trend. They are keenly aware that many buyers will never ski the backcountry but want to dress the part. Those marketing shifts have coincided with a generation raised on the glorification of risk. From X Games to YouTube videos, helmet cameras to social media, the culture rewards vicarious thrills and video one-upmanship. This generation no longer automatically adheres to the axiom of waiting a day for safer conditions. The relative placidness of inbounds skiing is no match for the greater adventure of untamed terrain. Among avalanche forecasters and the growing cottage industry of safety instructors, there is pride in noting that the number of fatalities has risen at a slower rate than the number of backcountry users. But they see themselves as part of a difficult race between the coming hordes and the tools to protect them. Air bags are designed to keep a skier closer to the surface of an avalanche. At the top of Seventh Heaven, the members of the group took off their skis and snowboards. Directly to the right of the lift’s unloading ramp was a narrow trail that disappeared up through a clog of trees. While there are no laws dictating what equipment people carry into the backcountry, there is a code. Carry a beacon (for sending and receiving signals), a probe (for poking for victims in the snow) and a shovel (for digging them out). One member of the party did not elicit a beep: Erin Dessert, a 35-year-old snowboarder who was early for her afternoon shift as a Stevens Pass lift operator. Wesley invited her along. She thought everyone was riding off the front side of Cowboy Mountain, back into the ski area. The group marched single file along the narrow ridge for a few minutes until it reached a wider area to convene. Tracks dropped back over a steep edge and into the ski area to the left. To the right was nothing but deep powder, hidden by thick trees, like a curtain to the big attraction. There were 16 people, although no one thought to count at the time. Their ages ranged from 29 to 53. “This was a crew that seemed like it was assembled by some higher force,” Dessert said. It was about 11:45. The storm had passed. A low, pewter sky hid the surrounding peaks. Castillo glanced around at the others, wearing helmets and rainbow hues, a kaleidoscope of color amid the gray surroundings, like sprinkles on vanilla ice cream. “I was thinking, wow, what a bunch of heavies,” he said. There was loose banter and a few casual introductions. Not everyone met everyone else. Someone pulled out marijuana to smoke, and passed it. Wesley, the snowboarder known as Tall Tim, saw the size of the assembled group. More than a dozen, he thought. There was little doubt that those with Tunnel Creek experience knew the way. About half the group had been down dozens of times each, if not hundreds. The others would follow. There was no broad discussion of the route down. Pockets of the group talked about staying left, not being too greedy by going too far down the meadow before cutting across. Unspoken anxiety spread among those unfamiliar with the descent. The mere size of the group spooked some. Backcountry users of all types — skiers, snowboarders, snowmobilers and climbers — worry about how much of a load a slope can absorb before it gives way. They worry about people above them causing an avalanche. When it comes to the backcountry, there is usually not safety in large numbers. That is not only because of the physical impact on the snow. It is because of the complicated dynamics that large groups create. Deadly avalanches are usually the product of bad decisions — human nature, not Mother Nature. Carlsen, Stifter’s Powder colleague, was uneasy. He tried to convince himself that it was a good idea. After a few minutes, the small talk faded. Worries went unexpressed. It is a tenet of avalanche safety, and the command snapped the group to attention. Rudolph, the Stevens Pass marketing director, teamed with Saugstad, the professional skier. Jack, on borrowed Salomon skis, paired with Joel Hammond, the Salomon representative. Carlson looked at Pankey, his childhood friend. “Dude, you’re coming with me,” he said. Wesley gave a little whistle to Carlson and Pankey and nodded downhill. He wanted to be first. The conditions were too good to waste time, and he did not want to be slowed by the huge pack. With little warning, Wesley dropped straight through the large cluster of trees, using firs as a slalom course. Pankey and Carlson followed. Rudolph, always up for competition, sped around the trees, not through them. He curved around a banked C-shape turn that dropped him a couple hundred feet into the broad meadow below. He arrived just in time to see Wesley, Pankey and Carlson burst from the trees into the open powder. Rudolph pointed his ski poles and playfully shouted invectives as their tracks crossed. Wesley laughed, and his two friends followed him left and over a small rise. Rudolph headed straight down the mountain. All the locals in the group presumed they knew what the others were thinking. They did not. Earlier that morning, Wesley and Carlson had skied the opposite side of Cowboy Mountain, in the ski area. It had been cleared of avalanches by the ski patrol at dawn, but the two still triggered several slough slides — small, shallow avalanches that washed at their feet and petered out before snagging victims. “That’s why, when they said we’re doing Tunnel, I was like, ‘Ooh, dicey,’” Wesley said. Pankey and Carlson followed Wesley and looked back, too, wondering why Rudolph and the others were not following them toward relatively safer terrain. Within a minute, long enough to be well out of sight of the group they left behind, the three men found something that made them stop. After breaking from the larger group, Ron Pankey and two others discover nearby avalanche activity. Alarmed, the three decided to go farther left. They crossed through trees and avoided big meadows and steep pitches. They soon found evidence of another avalanche, this one cutting through the forest. Wesley had disappeared in the pale light. He left nothing but a track through the deep snow that the others tried to follow. Rudolph stopped on the left edge of the upper meadow, above a cluster of trees. Others filed behind him, spilling down the mountain in plumes of spraying snow. Erin Dessert did not follow. She was confused. She was once a Tunnel Creek regular, until a nonfatal avalanche captured five friends in 2002 and scared her away. She headed hard to the right, away from the others. The other snowboarders that she knew, Carlson and Wesley, were gone in the opposite direction. Some in the remaining group noticed Dessert heading away in the distance and dismissed her as an oblivious backcountry rookie. She dipped out of sight in a lonely panic. Rudolph and the others, now a group of 12, were focused downhill. It was 11:52 a.m. Rudolph did not wait for the back of the pack to arrive before continuing to demonstrate the way. It was not Megan Michelson. It was Elyse Saugstad. Saugstad traced through the knee-deep snow just to the right of Rudolph’s elongated S-shape tracks. She dipped through trees at a pinch in the meadow and disappeared out of sight. She crossed over Rudolph’s tracks and giggled. After about 30 seconds, she was back at Rudolph’s side, having cut left into a notch of the trees again. Elyse Saugstad, second in the group, skis Tunnel Creek. Castillo and Brenan teased each other about who would go next. “Finally, he’s like, ‘Go ahead, I got eyes on you,’” Castillo said. From where Rudolph and Saugstad stopped, they could not see the subsequent skiers approach. Castillo went past and cut left. His camera recorded Rudolph and Saugstad whooping their approval as he stopped in a shower of powder, about 40 feet below them. But just before he stopped, Castillo was jolted by a weird sensation. Castillo stopped above two trees. He nestled close and pushed his right ski tight against them. His helmet camera showed that 14 seconds after Castillo stopped, Brenan appeared through the trees above Rudolph and Saugstad. Brenan had hugged the tree line on the left, avoiding the open meadow, then slalomed through the patch that the others used for protection. He stopped in a spray of snow a few feet from Rudolph and Saugstad. “That was sick!” someone shouted. Castillo silently took note of the terrain. But he knew the direction of the slope did not follow the meadow. It dipped harder left into the trees, down toward a gully. And there were still a lot of skiers above them. Saugstad was next to Rudolph. Brenan was a few feet away. Castillo kept his attention up the hill. Less than 30 seconds after Brenan stopped, he saw Tim Wangen cut through the trees above the earlier arrivals, gliding horizontally through the forest. Wangen had been taught how to navigate Tunnel Creek by his father. He knew that the farther down the mountain he went, the harder it would be to cut over the ridge and into the next big meadow. He crossed the shallow gully and rose up the other side. Wangen had told Peikert to follow his tracks, and Peikert was close behind. Castillo watched where they went. “Want to cut over?” Castillo shouted to those above him. The start of an avalanche is unlike any other force of nature. A hurricane is foretold by wind and lashing waves. A tornado often is spotted before it strikes. Lightning is usually presaged by black clouds and rumbling thunder. Avalanches rarely provide such a warning. Unlike waves or wind, tremors or storms, they are usually triggered by their own victims, sometimes unaware of what has been unleashed. Back up the mountain, Jack never seemed worried. That was his nature. Here he was, a rare weekend off, skiing with some of his best friends from Leavenworth and people from Powder and ESPN and all over the industry, on an epic run on a perfect powder day. Carlsen, the Powder photographer, had never been to Tunnel Creek. The first few easy turns gave way to a slope that fell steeply away, out of sight. He sidled up to Jack. Jack flowed through the thick powder with his typical ease. He skied the way other people walked down a sidewalk, a friend had said. Jack disappeared over the knoll, gliding through the trees in the middle of the meadow. Behind him, the five remaining skiers watched in silence. Then the snow changed without warning. Across the meadow, above Jack, loose snow seemed to chase him down the hill and out of sight. Not everyone saw it. A couple did. They caught it in their peripheral vision and were unsure what to make of it. “That was sketchy,” Hammond said. The five others listened. Not a sound. They stared for clues through the flat light below a murky sky. Nothing. Silent seconds ticked. Finally, Hammond spotted the first sign of evidence. It came from a tree, one among thousands, far down the hill, almost out of sight. Only the top of it was visible, and it was covered in snow. A few hundred yards down the mountain, a ghostly white fog rushed through the forest. Wangen and Peikert had just traversed in front of its path. It did not miss them by much. It was a blur of white, its shattered pieces moving about 50 m.p.h., a powder cloud two stories tall. Rudolph was the only one to scream. Saugstad tried to stride right, hoping to escape. She barely moved before snow flowed through her legs, dragging her down like a riptide. She pulled the cord on her air bag. She was overwhelmed so quickly by the rising snow that she did not know if it inflated. She is likely to have tumbled just past Castillo. He groaned and turned his face away. He stuck his head between two trees, like a prisoner in a stockade. For 16 seconds, snow and ice pounded his back and washed over him. His shoulders were jammed against the trees. His face pushed into branches of pine needles. He could feel the heavy assault of snow lashing at his back. Trees cracked around him. Some in the path were chopped in half — the stumps left in the soil, the rest carried away in the growing torrent. The avalanche, a relatively small one, started with about 6,000 cubic meters of snow and collected 7,000 cubic meters more on the way down. It probably weighed about 11 million pounds. The trees Castillo hugged in each arm swayed but held. He told himself that when he felt the flow slow, he would pop a hand in the air so that it might stick out of the snow and make him easier to rescue. Castillo saw daylight again. His camera captured snow sliding past his legs for another 13 seconds. The forest sounded as if it were full of sickly frogs. It was the trees, scrubbed of their fresh snow, still swaying and creaking around him. Castillo turned to look back up the hill. “Where there were three people, there was nobody,” Castillo said. He did not know who or what set off the avalanche. He did not know how far down the mountain it went. All he knew was that about a dozen people had been above him a minute earlier, and that the gully below him descended another 2,000 vertical feet to the valley floor. “Johnny! Johnny Brenan!” Castillo screamed into the stillness, his voice escalating with panic. The scope of the disaster was too much to comprehend. He wanted to find his partner. Streams of snow still flowed downhill as he scooted toward the heart of the slide path. It flowed into a wide gully, maybe 100 feet across, that narrowed as it descended. Castillo turned his beacon to “search” mode, meaning he would receive signals of those buried, but would not emit signals himself. Across the gully, unable to see anyone else, either, Peikert and Wangen had gone into search mode, too. “I was like, if there’s someone in that, the clock’s ticking,” Peikert said. Chances of survival drop precipitously every minute. According to a recent study, the survival rate for individuals completely buried in an avalanche falls to about 40 percent after 15 minutes of burial and to 25 percent after 30 minutes. About 75 percent of avalanche victims die from asphyxia or suffocation. The other 25 percent of fatalities result from trauma. Castillo spotted Peikert and Wangen across the gully. They, too, were nervous about hangfire, the unstable snow left along the edges of an avalanche’s path that can release at any moment. The avalanche had turned the gully into an oversize bobsled run, with slick, high-banked walls. Wangen stayed mostly on the banks. Peikert and Castillo crossed the gully a couple of times, reluctantly and quickly. “What’s your name again?” Castillo shouted at Peikert. It was soon apparent that the victims, however many there were, suffered one of two fates: they were hung up on the banks of the gully, snagged by a tree or buried in snow, or they had been flushed to the bottom, thousands of feet below. If searchers spent too much time looking along the gully, they might squander a chance at rescuing someone at the bottom. If they rushed downhill, they might pass someone in need of saving. Castillo called 911. It was 12:02 p.m. The avalanche occurred seven minutes earlier. The dispatcher asked him to slow down. Castillo, occasionally shouting at others nearby, tried to explain where the avalanche occurred. He was asked how many people there were. The dispatcher asked if anybody was hurt. The call lasted four minutes. Castillo, carrying his friend’s ski, turned down the mountain. Near the top, the five skiers who planned to follow Jim Jack deciphered what happened through a series of increasingly blunt clues. Loose snow. A shaking tree. Hammond was due to ski next. He took a couple of turns through the fine powder of the meadow and stopped. There was a sudden drop, nearly three feet deep. The fluffy snow was gone. A surface of bluish ice stretched down the hill, into the trees and out of sight. He shouted for everyone to go into search mode. The other four skiers moved quickly to see. Others started dialing numbers, too. They called Chris Rudolph and Elyse Saugstad. There were no answers. Hammond dropped onto the slick slide path. Another clue lay on the ice, pointing downhill. The realization that Jack had been carried away was a gut punch. Michelson called 911. According to sheriff’s department records, it was 12:03 p.m. The dispatcher asked if people were buried. Word was relayed to the ski area. Chris Brixey, manager of the Stevens Pass Ski Patrol, had 17 patrollers working on the mountain that day, two more in the aid room, and a dispatcher. Brixey is a regular at Johnny Brenan’s Monday night poker parties. He did not know that a group of friends, including Rudolph, his Stevens Pass co-worker, had gone to Tunnel Creek. Brixey called the area’s most seasoned patroller and put him in charge of the four-member first-response unit, called the hasty team, to follow the group’s trail. He also enlisted other patrollers and a pair of avalanche rescue dogs. Word of a large avalanche in Tunnel Creek soon echoed around Stevens Pass, from the patrol room to the R.V. lot, up the lifts and down the slopes. According to the Stevens Pass Ski Patrol log, the area closed public access to the boundary gate atop the Seventh Heaven lift at 12:19. By then, the group that had started off together less than 30 minutes earlier was strewn up and down nearly 3,000 vertical feet. No one knew how many were missing. Keith Carlsen was nearest the top, searching for Jack. The others headed down, scanning the path and its edges with their beacons. Carlsen methodically checked the upper meadow. Scared and alone, Carlsen’s voice broke the silence. Farther down, others followed the path into the gully. As it descends toward the valley floor, it carves deeper into the mountain. In some spots, canyon walls are 20 feet high. There were steep, icy drops that would become gushing waterfalls during the spring runoff. It was still clogged with rocks and trees that had not been fully scoured away. Where the ravine bent, the avalanche rode high on the outside wall, like a child on a water slide, sometimes breaking over the top of the bank and unearthing trees on the ridges. It became increasingly evident that whoever was caught in the avalanche would be found at the bottom. Tim Carlson and Ron Pankey, having split from the big group at the top, nervously negotiated the roundabout route to the bottom of Tunnel Creek. They could not catch up to Tim Wesley, but followed his snowboard track to the valley floor. It was 12:07 p.m. They glided past the foot of a mound of chunky debris. One of the ravines had spewed a sizable avalanche, but there was no way to know it had occurred in the past few minutes. Just after the avalanche, Ron Pankey and Tim Carlson discover the debris pile. Carlson clicked out of his snowboard bindings and climbed onto the pile. Pankey turned his beacon to search mode. It beeped immediately. His skis off, Pankey climbed onto the debris pile, too. He saw the ski pole and two gloves. He was sucker-punched by dread. Then he noticed the brand. “That was my thought — Oh, God, those are Scott gloves. Jim Jack was wearing Scott gloves,” Pankey said. “I probably searched for maybe a minute before I was on top of a signal,” Carlson said. “Your signal goes ‘beepbeepbeepbeepbeep - BEEPBEEPBEEPBEEPBEEP,’ and it gets a little fainter, like oh, over here. I got a strong signal, traversed over, got a weak signal, went back, got a strong signal, went back and I was basically on top of a body. The two men dug frantically. His body had been pummeled. They turned off Jack’s beacon and tried to lay him peacefully in the snow. Pankey pushed his eyelids closed. She asked him for his name. Jack’s phone chirped. It had survived the avalanche, and Pankey reached into Jack’s pocket and pulled it out. It was a text message from Jack’s girlfriend, Tiffany Abraham. Rumors of a big avalanche in Tunnel Creek had reached the base area of Stevens Pass. Pankey looked over at the ski pole sticking straight out of the snow. It looked familiar. Pankey had noticed it on the hike up the ridge to Cowboy Mountain. At the upper end of the meadow, more than 100 yards away and out of sight, Elyse Saugstad waited in the silence, unable to move. She did not know how long she had been frozen there — head pointed downhill, hands sticking out of the snow, face poking through the ice just enough to breathe and see the breaking clouds trailing the weekend’s storm. Her hip ached. Her mind wandered. She wondered who else was caught in the avalanche. She wondered who was left to rescue them. She felt herself getting colder. Her pink mittens, like those of a child’s, had strings that attached them to her jacket. When she had come to a stop, one of the mittens was on her hand. The other was off, hanging from her wrist. Saugstad could not claw the hard-packed snow with her mittens on. She took them off and picked at the ice until her fingers ached. She put her mittens on again until they warmed up. She had not spoken since the avalanche stopped. It had not occurred to her to cry for help. Someone would come. She hoped. Finally, for the first time, she shouted. The face of Wenzel Peikert startled her. Among those who skied down the gully, Peikert arrived first to the avalanche’s final resting place. The walls of the ravine slowly fell away and opened onto a wide, sloping meadow. It was covered by an enormous pile of chunky ice cubes, some fit for a cocktail glass, others the size of couches. The debris was filled with dirt, rocks and shredded tree parts. It stretched about 150 yards down what remained of the slope. It was 10 or 20 feet tall, obstructing Peikert’s view to the bottom. Peikert’s beacon began its frantic chirping. Saugstad was about 20 feet downhill. Peikert pulled his shovel from his backpack and started to dig. Peikert hurried, knowing that others were likely buried nearby. Finally, Michelson and Abrams arrived from above. They found Peikert and Saugstad on their feet. Over several minutes, others trickled down from above. Michelson took charge as an impromptu site commander. No one was sure who was missing or how many victims there might be. Michelson used her beacon and pinpointed two spots for others to search, then continued sweeping the meadow to search for more. Peikert and Rob Castillo dug through the ice. It had been more than 30 minutes since the avalanche. Johnny Brenan was discovered about three feet below the surface. He had been buried a few feet from Saugstad all along. Castillo, Brenan’s longtime friend and ski partner, worked side by side with Peikert, at last getting his legs out. “The muscles were just beat,” Castillo said. About 20 feet up the hill, Abrams, Wangen and Stifter zeroed in on a victim, too. It was the spot that Peikert had marked with his pole before he spotted Saugstad. Digging was nothing like scooping snow from a driveway. It was more like shoveling the chunky piles that snowplows leave along the side of a cleared highway, full of large pieces seemingly glued together. Quickly exhausted, they rotated frequently. Finally, they reached a victim: Chris Rudolph. Stifter performed C.P.R. on Rudolph: 2 breaths, 30 compressions, to the point of exhaustion. Saugstad called 911. It was 12:40 p.m.
“I’m reporting an avalanche,” she said, breathlessly. Frantic voices behind her shouted encouragement. The dispatcher said there were “units on scene.” Saugstad said they had not arrived and asked if they were coming by helicopter. “Uh, we do not have a helicopter yet in the area because of the avalanche risk,” the dispatcher said. Hammond was the last to arrive from above and took over trying to revive Rudolph. Twenty feet downhill, the huddle around Brenan slowly came to the same conclusion. Peikert had been performing C.P.R. for close to 30 minutes, with Castillo’s help. An hour’s worth of adrenaline dissolved to disheartened shock. A few other skiers had happened upon the scene, but no rescue help had arrived. Saugstad walked around dazed, wearing her deflated air bag “like dead angel wings,” Carlsen said. Castillo made his way to the bottom of the hill to learn that Jim Jack was dead, too. Erin Dessert, the snowboarder who had veered away from the group at the top, frightened by the direction everyone was headed, had cautiously made her way down and rediscovered the group. She cradled Rudolph’s head as others tried their last attempts to resuscitate him. Laurie Brenan and Tiffany Abraham, Jack’s girlfriend, were both in the Bull’s Tooth Pub and Eatery, on the second level of the Granite Peaks Lodge. The man next to Abraham, a neighbor from Leavenworth, overheard. There was an avalanche in Tunnel Creek, he said. Someone came into the restaurant a while ago and asked for volunteers to help search. Abraham’s heart sank. Normally a font of buoyant optimism, she had a sudden pang of dread. She could tell immediately that bad news was waiting. She spotted a friend who was on his way to the scene. They went into the ski patrol room, on the ground level on the backside of the lodge. Inside is a first-aid room with beds for injured skiers. Beyond is a ski patrol break room, a couch against one wall. Anne Hessburg, Rudolph’s girlfriend, was sitting there, balled up in tears. She had skied all morning with a friend and taken an early lunch at the Iron Goat pizzeria. She walked up to the slope-side cabin that Rudolph had provided to the journalists from Powder magazine. Hessburg stored skis there. A friend received a call while she was there. Hessburg rushed to the ski patrol room. She could tell by the way people were moving that it was something serious. She could hear the squawks on the walkie-talkies. Someone told her only that Rudolph was probably involved, as if to break the emotional fall. Brixey, the ski patrol manager, confirmed it. Rudolph was dead. That was about when Abraham walked into the patrol room with her friend, noticing a broken Hessburg on the couch. Abraham’s friend turned to her, looked her in the eyes, and told her about Jack. “Baby girl, he’s gone,” he said. Laurie Brenan had no premonition. She watched Abraham rush out of the restaurant at the news of an avalanche and casually followed a few minutes behind. She tried to stay out of the way as people hurried in and out of the patrol room. Brenan spotted Brixey, the patrol manager and Monday night poker player, and waited for an opening to approach. It was true. One 911 call from Tunnel Creek had reported the death of Jack. Another had reported the death of Rudolph. A third made mention of a third fatality, but the dispatcher never asked the name. Brixey did not learn about Brenan until his own patrol members reached the scene. Brixey’s outward calm belied the turmoil inside. As a paramedic, he had told a lot of strangers that a loved one had died. But never a close friend. They walked past the empty beds, past Hessburg on the couch, past Abraham. In the office, he turned to her. Brixey left. Brenan melted into shock. Finally, a friend from Leavenworth came in. He had gone to Tunnel Creek about 20 minutes behind the large group and happened upon the scene. Back on the other side of Cowboy Mountain, and down a meadow that had been turned inside out, weary huddles surrounded three dead men. Hope had surrendered. Rescues became grim vigils. The survivors did not know what to do other than wait. The bodies and faces of the victims were covered in jackets because it seemed the respectful thing to do. Survivors introduced themselves to those they had not met. A group of 16 skiers and snowboarders, all of them experts, all of them unable to refuse the temptation of an hourlong excursion into steep powder, had been reduced by three lives. The first ski patrollers, along with an avalanche dog named Cava, arrived at 1:05 p.m., 70 minutes after the mountain gave way. They had started at the top and combed the entire path, following the funnel from the wide upper meadow through the flumelike ravine, searching for victims along the way. By the time they spit out of the mouth at the bottom, there was no rescue to be done. The patrollers recognized faces in the huddles. They realized then that they had been searching for friends, not strangers. They stopped to find Rudolph and Brenan. Another patroller headed farther down to learn about Jack. More patrollers began to arrive from below, on snowmobiles brought from the highway. A scene of quiet contemplation buzzed with activity and a second wave of despair. The patrollers tried to revive the victims. It was useless. They were probably dead by the time the avalanche stopped, or shortly after. Brixey, working by radio over the mountain at Stevens Pass, told all rescue units to stand down. A second surge of patrollers would assist in taking the bodies off the mountain. The survivors were encouraged to make their way to the highway, where ambulances awaited. Saugstad, missing a ski, used the one of Jack’s that had been found. Hammond had been carrying it on his back. Stifter and Carlsen sat on the meadow, unable to pull themselves away. As with other survivors, the quarrel with their own guilt began immediately, the first sign that avalanches swallow more lives than just the ones buried beneath the snow. They wondered if their mere presence at Stevens Pass that weekend gave rise to the Tunnel Creek trip, a group of proud locals eager to show off for influential out-of-towners. They wondered why they recognized all of the danger signs, starting with the avalanche report that morning over coffee, but did not do enough to slow or stop the expedition. They wondered if they could have saved lives after the avalanche by speeding to the bottom rather than combing the path. They wondered how so many smart, experienced people could make the types of decisions that turned complex, rich, enviable lives into a growing stack of statistics. Activity disturbed the quiet again. A Sno-Cat, a large machine with treads to climb through snow-covered terrain, rumbled through the trees below and parked at the bottom of the debris pile. Ski patrollers solemnly marched up the hill, carrying gear to wrap the bodies. It was one deadly avalanche accident among many, perhaps no more worthy of attention than any other. It was not the nation’s deadliest avalanche of the season. And it was not at all like the one that killed 96 people near Tunnel Creek more than a century ago. But some rituals do not change. The accidents end with an unrefined ceremony. Some patrollers stopped at Jack and wrapped him in a crude bundle using red blankets and rope. Others hiked to where Stifter and Carlsen sat. They wrapped the bodies of Brenan and Rudolph, with quiet expediency and reverence. The story in the words of the survivors. Graphics and design by Hannah Fairfield, Xaquín G.V., Jon Huang, Wayne Kamidoi, Sam Manchester, Alan McLean, Jacky Myint, Graham Roberts, Joe Ward, Jeremy White and Josh Williams. Photography by Ruth Fremson. Video by Catherine Spangler. Additional video by Eric Miller and Shane Wilder. Kristen Millares Young contributed research. The reporting for this article on the Feb. 19 avalanche at Tunnel Creek was done over six months. It involved interviews with every survivor, the families of the deceased, first responders at Tunnel Creek, officials at Stevens Pass and snow-science experts. It also included the examination of reports by the police, the medical examiner and the Stevens Pass Ski Patrol, as well as 40 calls to 911 made in the aftermath of the avalanche. The Swiss Federal Institute for Snow and Avalanche Research provided a computer-generated simulation of the avalanche, based on data accumulated from the Stevens Pass accident report and witness accounts. Additional sources are: LIDAR data from King County GIS Center; Iowa Environmental Mesonet, Iowa State University; Mark Moore, U.S. Forest Service; National Avalanche Center. A version of this article, which includes an epilogue, is available as an e-book. Purchase at byliner.com.